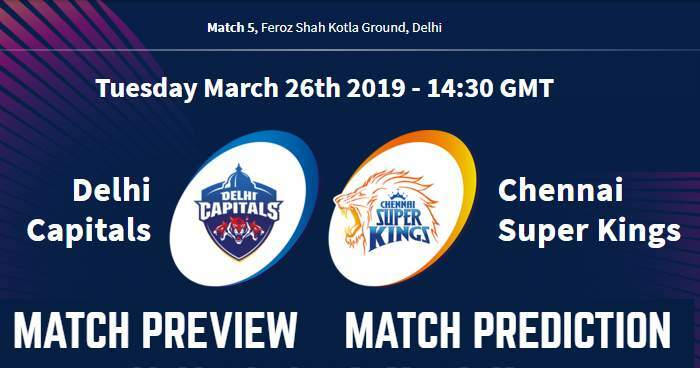 Home / Chennai Super Kings / CSK / DC / Delhi / Delhi Capitals / Delhi Daredevils / Feroz Shah Kotla / IPL / IPL 12 / IPL 2019 / IPL 2019 Match Preview / Match Prediction / IPL 2019 Match 5 DC vs CSK Match Prediction, Preview and Head to Head: Who Will Win? 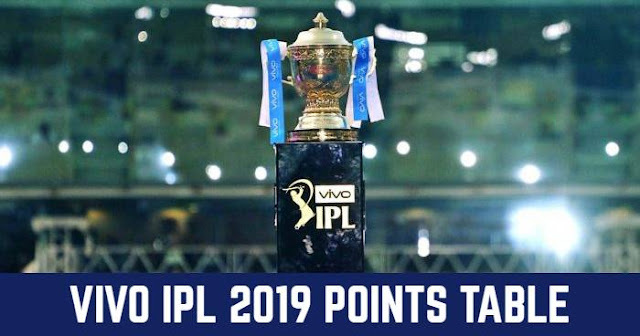 IPL 2019 Match 5 DC vs CSK Match Prediction, Preview and Head to Head: Who Will Win? Toss: Delhi Capitals won the toss and elected to bat first. Playing XI for DC: Shreyas Iyer (c), Prithvi Shaw, Shikhar Dhawan, Colin Ingram, Rishabh Pant (wk), Keemo Paul, Axar Patel, Rahul Tewatia, Amit Mishra, Kagiso Rabada, Ishant Sharma. Playing XI for CSK: MS Dhoni (c & wk), Shane Watson, Ambati Rayudu, Suresh Raina, Kedar Jadhav, Ravindra Jadeja, Dwayne Bravo, Deepak Chahar, Shardul Thakur, Harbhajan Singh, Imran Tahir. DC Squad: Shreyas Iyer (c), Kagiso Rabada, Chris Morris, Bandaru Ayyappa, Sandeep Lamichhane, Colin Munro, Ishant Sharma, Colin Ingram, Trent Boult, Shikhar Dhawan, Manjot Kalra, Nathu Singh, Sherfane Rutherford, Prithvi Shaw, Rahul Tewatia, Ankush Bains (wk), Avesh Khan, Axar Patel, Rishabh Pant (wk), Harshal Patel, Keemo Paul, Hanuma Vihari, Amit Mishra, Jalaj Saxena. CSK Squad: MS Dhoni (c & wk), Imran Tahir, Ruturaj Gaikwad, Sam Billings (wk), David Willey, Murali Vijay, Ravindra Jadeja, Deepak Chahar, Narayan Jagadeesan (wk), Suresh Raina, KM Asif, Shradul Thankur, Dhruv Shorey, Mohit Sharma, Faf du Plessis, Monu Kumar, Dwayne Bravo, Chaitanya Bishnoi, Karn Sharma, Lungi Ngidi, Shane Watson, Ambati Rayudu, Harbhajan Singh, Kedar Jadhav, Mitchell Santner. The 6th match of the 12th season of Indian Premier League (IPL 2019) will be played between host Delhi Capitals (DC) and Chennai Super Kings (CSK) on 26th March 2019 at Feroz Shah Kotla Ground, Delhi. As far as weather is concerned, it will a pleasant evening with the temperature below 25° during match hours. This will be the first match to be played at Feroz Shah Kotla, Delhi in this season of IPL so pitch is still a mystery for this season. But Feroz Shah Kotla Ground is known for its slow pitch with providing assistance to spinners. Delhi Capitals began their season with a convincing 37-run win over the Mumbai Indians on Sunday night are at the top in the points table. However, Chennai Super Kings are 2nd on the points table after defeating Royal Challengers Bangalore by 7 wickets in a low scoring game. Looking at the slow pitch at Feroz Shah Kotla, Delhi Capitals can add up an extra spinner to the team which played on batting friendly pitch on Sunday at Wankhede Stadium. Sandeep Lamichhane or Amit Mishra can replace Trent Boult. Chennai Super Kings are most likely to stick to the same playing XI. Chennai Super Kings (CSK) and Delhi Capitals (DC) have played 18 matches against each other head to head in Indian Premier League, out of which 12 are won by Chennai Super Kings and 5 are won by Delhi Capitals. In last season, IPL 2018, Chennai Super Kings and Delhi Capitals one match each played between them; won their home match. At Feroz Shah Kotla Ground, Delhi; Delhi Capitals and Chennai Super Kings have 6 encounter out of which Chennai Super Kings won 4 and Delhi Capitals won 2. Delhi wickets get slower as the match progresses, most suitable for bowlers. So most probably team winning the toss will like to bat first. Pitch is still a mystery and unknown to us, but a score above 180 will be good looking to the track record. In our prediction, Chennai Super Kings have more chance of winning the match. In our prediction, Chennai Super Kings are more likely to win this match.